So i had initially planned for a normal round cake with Clover Care Bear (made up of rice krispies of course) sitting atop, plus i had pre-dried a rainbow band (cos Care Bears love to slide down rainbows don't they?) which i was going to attach from the top surface of the cake and down to the cake board. but after drying it over night, my gut feeling told me that it ain't gonna work, the band was sure to snap in the middle. But i was keen on making a rainbow slide, cos really, what's a Care Bear cake WITHOUT a rainbow slide? So, i decided to go the safe route and carved the slide from the cake. glad i did that, cos i think it turned out pretty cute. So, i think a lot of people have been wondering if the rice krispies treats are edible. well, they technically are edible, but they are really hard. my kids love to hawk around whenever i work with rice krispie treats, hoping to pick up any stray bits. they are really good to eat when freshly made and still warm, but i must admit when they harden and set, they do become extremely hard. "Well then don't use it, for goodness sake's!" 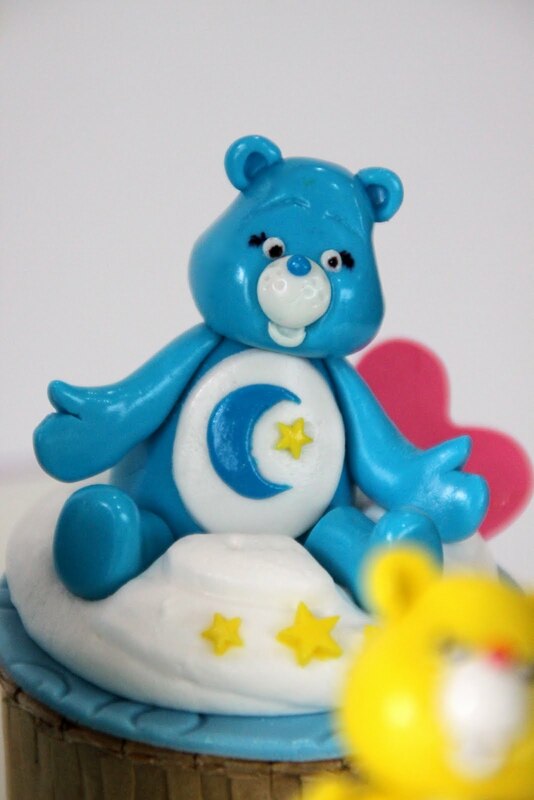 you might think, but my dear ladies and gents, not everything can be made 100% out of fondant, because if you imagine a huge lump of play dough ( this Care Bear was about 1.5 times the height of my hand), it sure isn't gonna stay in that way without sagging. "Then make it out of cake!!!" you might think again. Again, my dear ladies and gents, cake is food after-all, and we cannot bend it and carve it in any way we want without the effects of gravity. moreover, the size of these moulded cake toppers are big, but not that big enough to be sculpted out of cake. I do know of many cake decorators who opt for styrofoam instead, but i prefer not to go that route simply because i don't really fancy the idea of adding to many "inedible" elements to my cake. I was also requested to make 4 cupcakes on the side with sugar figures of Bedtime Bear, Cheer Beer, Birthday Bear and Friend Bear as toppers. But i only managed one clear shot of the 4 cupcakes. the rest were to blurry and we were rushing to send out the cake. dang. 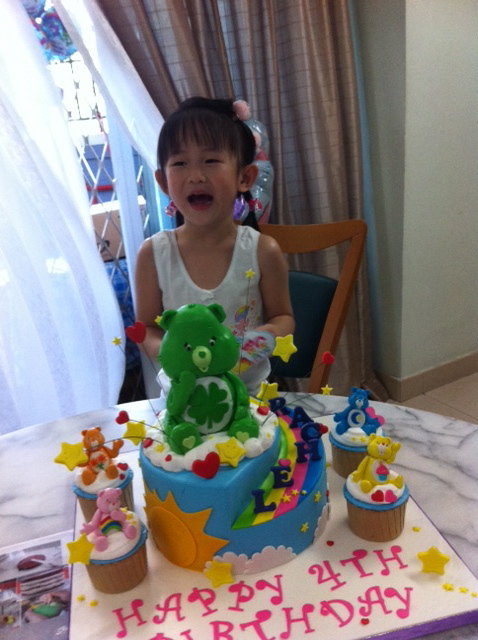 Here's a really cute pic of the birthday girl and her cake, which her mom sent! 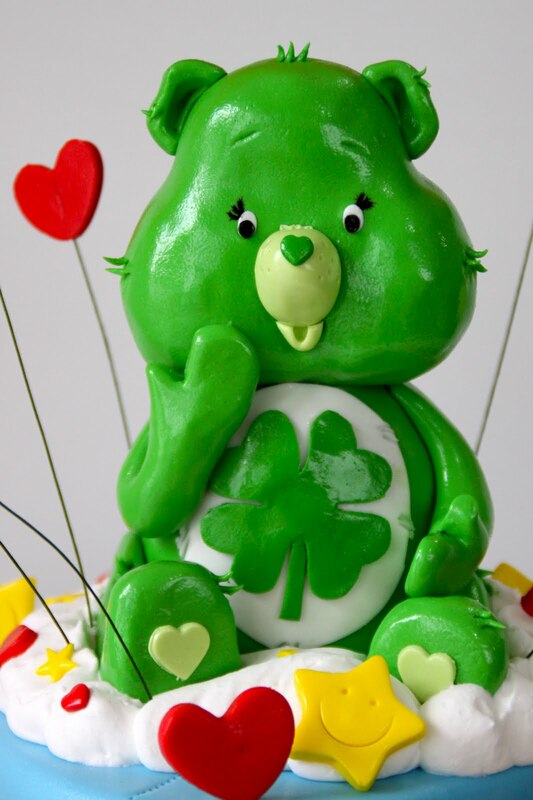 hello im keen to get a cake like this but with cheer bear as the main bear instead of clover bear! what is the pricing like?